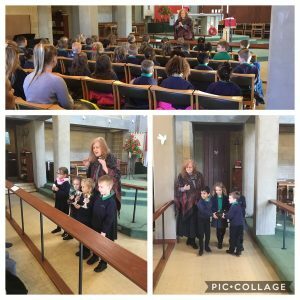 Today Year 1 walked to St Benedict’s Church to learn more about the topic Christianity. 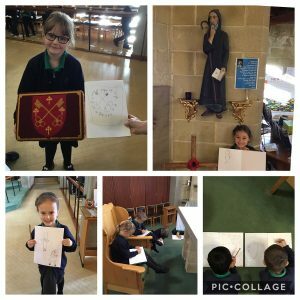 All the children walked sensibly to the Church full of enthusiasm and excitement to see what the Church looked like and what we were going to learn inside. Reverend Anne welcomed everyone into the church with open arms. She began by telling us about the faith Christianity and we discussed why people might visit a Church. 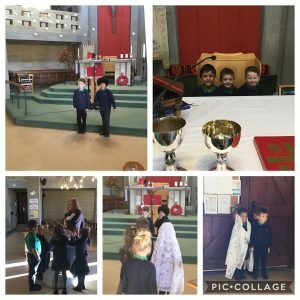 We then performed a pretend wedding and christening and dressed the children up to act out the important roles for each of these days! It was great fun!! After that, we walked around the Church to look at the different objects and to ask questions to Reverend Anne about the things we found. We looked at a font, prayer tree, prayer corner, St Benedict, Jesus on the cross, the altar and many more things. Lots of children loved how the Church was decorated with doves as a sign of peace. 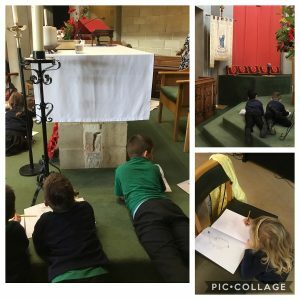 Once the children had asked Reverend Anne many questions, we began to sketch different parts of the church in our books. The children looked very closely at the finer details of some of the objects and really tried hard to replicate this in their work. We left the church singing Nativity songs and played eye spy for most of the way back to school!! What an amazing day. Reverend Anne praised all of the children on their behaviour and said they were a pleasure to have in her church! Well done Year 1, I am very proud of you all today for taking in all the new information and having a go at all of the different activities in the day!! What was your favourite part of the visit?